October is Breast Cancer Awareness Month and Freschetta™ Pizza has launched the Proud to Support Pink® campaign. The goal - to donate $50,000 to the Memorial Sloan-Kettering Cancer Center with our help! 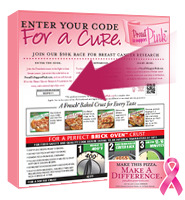 By purchasing specially-marked Freschetta Pizza or Artisan Pizza Crust, $1 will be donated for every proof of purchase code entered on this website: http://www.proudtosupportpink.com. In addition to the donation, by entering the special code (located on the back of the box ) on their website, you will be entered in a sweepstakes for an iPod shuffle®. There are 50 winners each week! And, if that was not enough, share with your friends and family to earn extra entries! They aren’t just rewarding you or me - each week they will also be giving 50 of the iPod shuffle® to one of these four Cancer Centers for patients receiving treatments. But wait... one last thing! I get to give away something right now via Rafflecopter! One Coupon for a free Freschetta Pizza and Two (2) pairs of Freschetta Proud to Support® earphones, one to give and one to keep!